Official Android 9.0 Pie is now available for the Samsung Galaxy A7 (all variant). You can download the firmware file from the link given below and install the same using the Odin tool. Read ahead; the step-by-step tutorial is provided below along with the necessary download links. From the last few months, Samsung is doing a great job of updating their devices to their latest One UI based on Android Pie. Some flagship devices like Galaxy S9, S8, and Note 8 already received the update while some of them are in the queue. Galaxy A7 users can now update their device to the Android 9.0 Pie official firmware using this guide. One UI for Galaxy A7 has already rolled out in several regions with a build number A750FNPUU1BSC4 via OTA (Over-the-air). 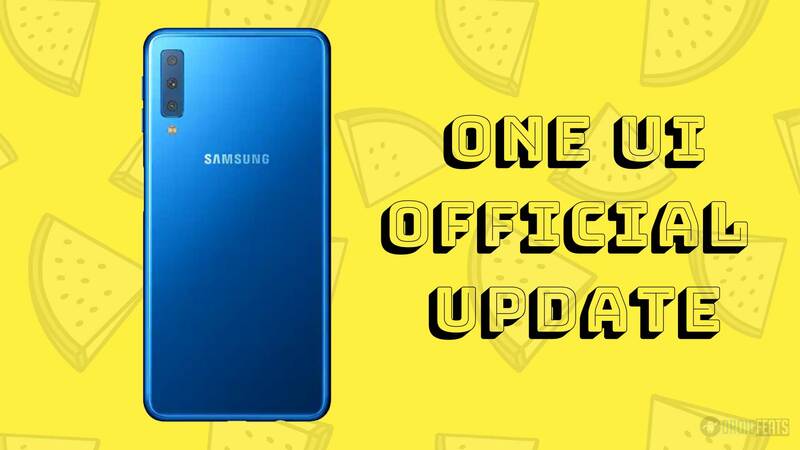 If you are unable to update your device via automatic update system, you can follow our tutorial below on how to manually update Galaxy A7 to Android Pie One UI using Odin flash tool. We got to know that the update with build number A750FNPUU1BSC4 for Galaxy A7 is rolling in Russia from the very first day of release. So, probably, those who are not from Russia may get the update a bit later. If you can’t wait, read ahead, manual installation guide is here for you! Why manual update via Odin? Bricked device: In case, your Galaxy A7 has been bricked while trying any custom ROM or mods, you can manually update your phone to recover and get back to stock position. But before heading to the main tutorial, please read the change-log of this build and the new features of One UI for the Galaxy A7. One UI for Galaxy A7 is on stable stage. This build contain massive changes including the whole new One UI skin. All the Android 9.0 Pie features by Google are integrated as well. Android 9.0 is a significant system update from Android Oreo that brings a bunch of new features and improvements. Being based on the latest irritation of Android, the update carries all the Android 9.0 goodies. Note: This update comes with February 2019 security patches. They will bring the latest update soon via OTA. LIKE this One UI Stock Firmware for Galaxy A7? We love it too, and we know you are looking forward to installing it on your phone. Please read the important information below before starting the tutorial. Go to Settings > About phone > Model number. If your device’s CSS is other than the mentioned above, you need to wait for some more days till Samsung release a newer build for your phone. Make sure you have correctly installed Galaxy A7 USB Driver on your computer. If not, please download from any official source and install it correctly. Otherwise, your computer will not detect your device. The ONLY TOP 6 Android data recovery software you should try! Once you are sure that you made a complete backup of your necessary documents, you can move ahead to the tutorial below and update Galaxy A7 to One UI based on Android 9.0 Pie official firmware. This tutorial may WIPE OUT all your DATA. Make sure to create a Backup of everything before starting the tutorial. Ready now? Let’s proceed to the tutorial below, and update Galaxy A7 to One UI Android 9.0 Pie official firmware. We have mentioned full step-by-step instructions on how to install Android 9.0 Pie official firmware on Galaxy A7. If you are entirely new to flashing a Custom ROM or an Official Firmware, please read the entire tutorial once before actually performing it on your device. Download the G950FXXU4DSBA / G955FXXU4DSBA firmware from the above-given link. Next, proceed to the installation tutorial from the link below. Please read the tutorial from the link above to install One UI Android 9.0 Pie Official Firmware on Samsung Galaxy A7. The procedure has been described properly with screenshots. If you got stuck somewhere, drop your comment below, and we will help you as soon as possible. Magisk: Download Magisk [all versions] ZIP and How to quickly root your device right now! Are you having fun playing with the major system upgrade? You can try out some Xposed modules, or you can even try Magisk modules to modify your device in the way you like. Next articleRealme 2 Pro updated with March 2019 Android Security Patch!